Avram Noam Chomsky (nohm CHOM-skee; born December 7, 1928) is an American linguist, philosopher, cognitive scientist, historian, social critic, and political activist. Sometimes described as the father of modern linguistics, Chomsky is also a major figure in analytic philosophy and one of the founders of the field of cognitive science. He is Institute Professor Emeritus at the Massachusetts Institute of Technology (MIT), where he has worked since 1955, and is the author of over 100 books on topics such as linguistics, war, politics, and mass media. Ideologically, he aligns with anarcho-syndicalism and libertarian socialism. Chris sits down with Noam Chomsky to discuss the state of American politics. They discuss the issues that exist in society at the moment, the development of those issues over the past hundred years, and how these trends may play out going forward. Chomsky talks at length about the future that he envisions for humanity. He is a terrific thinker and while you may not agree with all of his politics, he advocates for meaningful things in a highly intelligent manner. For the past forty years Noam Chomsky's writings on politics and language have established him as a preeminent public intellectual and as one of the most original and wide-ranging political and social critics of our time. Among the seminal figures in linguistic theory over the past century, since the 1960s Chomsky has also secured a place as perhaps the leading dissident voice in the United States. 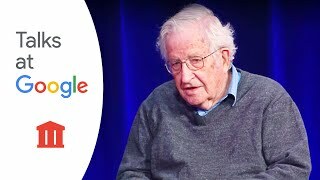 <br>In this talk from Google Cambridge in May of 2017 Professor Chomsky discusses wide ranging topics from the development of his personal political views to the control of information and media with Googler Hasan Khalil.